As an experiment, this is the first blog post form of a justforfunc episode, you can also watch the corresponding episode. We start with a very simple program, copied partly from Wikipedia, that creates a Mandelbrot fractal by first computing the color of each pixel, and then writing the corresponding image to a PNG file. In this first iteration createSeq, which calls pixel to compute the color of each pixel, one after the other. Finally, the part that is basically extracted from Wikipedia allows us to compute the color of a given pixel. The complexity value determines how complex the fractal gets, values from 4 to 2048 give various and interesting effects. Play with this! // Play with this constant to increase the complexity of the fractal. // In the justforfunc.com video this was set to 4.
x, y := 0., 0. At this point our program runs and creates a cool fractal, and it takes (in my laptop) around 4.7 seconds. 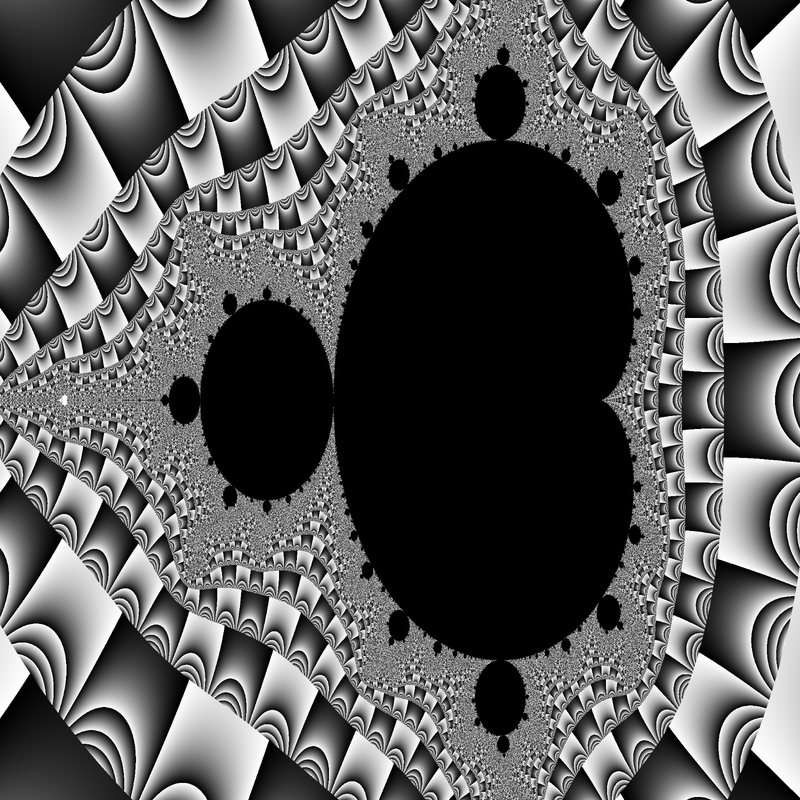 The resulting image is this cool fractal. In order to obtain more information about how the program performs we can profile the CPU usage with the runtime/pprof package in the standard library. Simply adding two lines of code at the beginning of the main function. Now if we run the program again it will output pprof profiling information into the standard output. Interestingly, adding pprof has not slowed the program much! And in exchange of that temporary performance hit we get much visibility on what the program spent its time on. Let’s open pprof and see what it spent its time on. We can now list how much time we spend in each function we call with list. .          .     51:// createSeq fills one pixel at a time. Ok, so it seems we spent most of the time in createSeq, makes sense! Great, again most of the time is in the line calling pixel, and what does pixel do? .          .    210:   // Play with this constant to increase the complexity of the fractal. .          .    211:   // In the justforfunc.com video this was set to 4.
.          .    218:   x, y := 0., 0. Ok, so we spend a decent amount of time computing multiplications in that loop, also a lot of time allocating pixels in line 224. We have a better idea of what our program spends most of the time: computing pixel values. But what do we do now? It seems reasonable that a program that generates fractals spends most of the time, well … generating fractals! There’s things we could do to try and optimize the CPU time, but in this post instead of going that way, we’re going to see what other things we can do to speed up the program without changing the pixelfunction. One of the problems of pprof is that it is a stastistical way of discovering how often a given piece of code is running. It allows us to understand what the program is running when it’s on the CPU, but what about when it’s not? We’re missing information that we can not (or at least not easily) extract from a pprof trace. The most powerful side of the Go execution tracer is the amazing visualization it generates, which allows us to see the “empty” space in our program. Let’s create a trace from this program, by simply replacing our pprof calls by calls to the runtime/tracepackage also in the standard library. 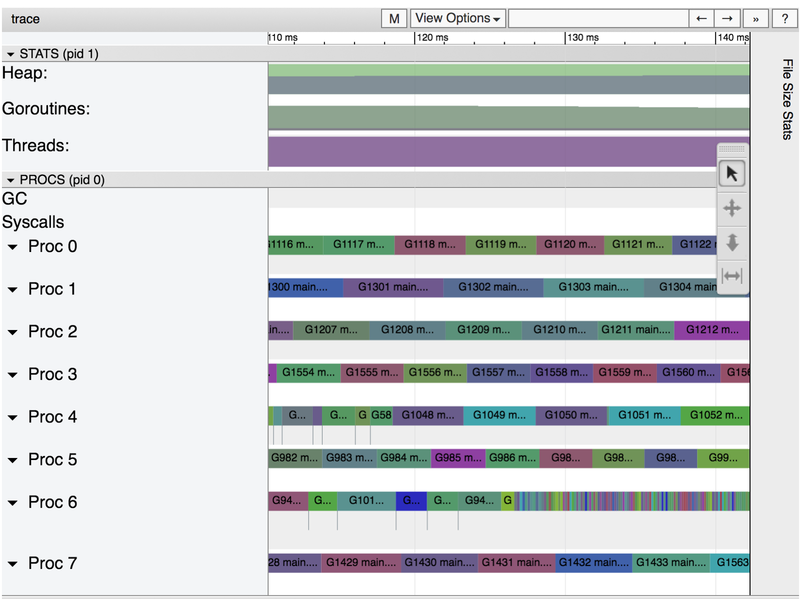 Then we can execute the program again an visualize the trace with go tool trace. I invite you to explore the visualization, specially the garbage collection event towards the end. But the most important point here is everything we can’t see. Do you see those 8 Proc? Those are the eight processors that my laptop has. Only one of them, processor 2 in my case, is really doing any work! One of Go’s powers is easy concurrency, right? Well, it’s time to use those, because we clearly are wasting CPU time by not expressing our program in a concurrent way which would enable parallelism. 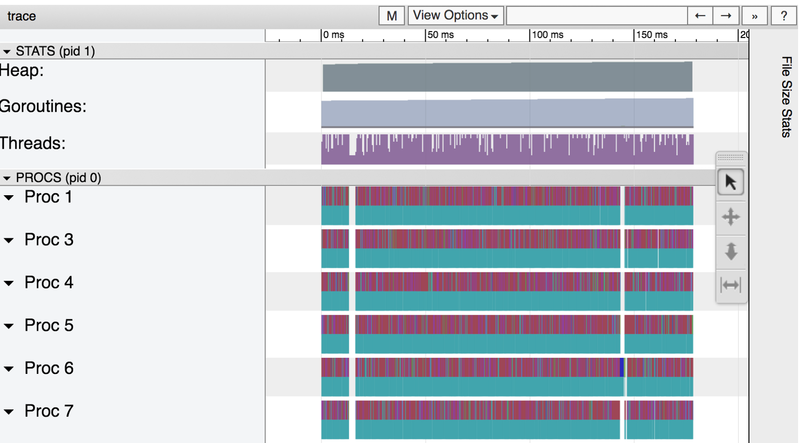 More concurrency, more parallelism, more speed! Let’s go to a ridiculuous extreme and decide that, since each pixel can be computed concurrently, we are going to create a goroutine per pixel. This, for our 2048x2048 image, means we’re going to create over four million goroutines. We say goroutines are cheap … so let’s seee if that’s true! 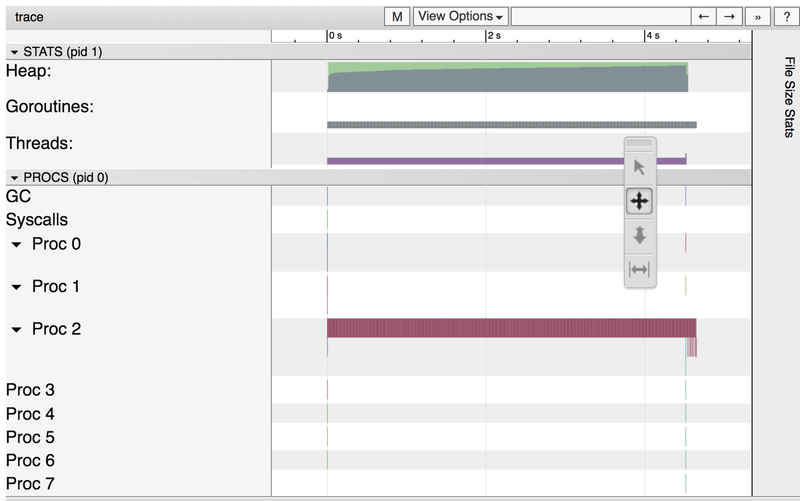 Ok, so first of all let’s run it without the tracer to see how fast it is and compare it to the sequential option. Wow, it’s actually faster! It used much more CPU time (13.70s) but since it distributed it so efficiently across our eight CPUs, the total time it spent running was only 3.2 seconds. Well, let’s create a trace and see what it looks like. Wow, we spent almost twice of CPU cycles than before! Why is this? 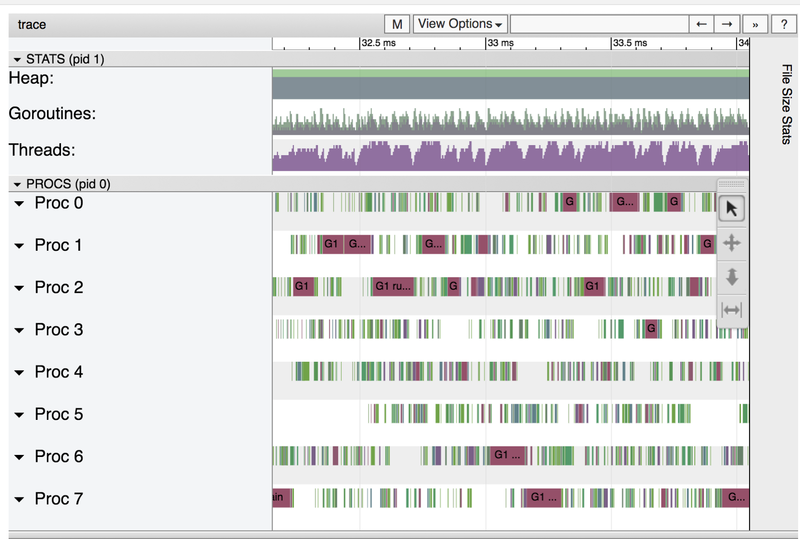 Well, the tracer has a performance cost, and in this case we’re logging each and every goroutine we create. This, by itself, might point to problem in our solution. Let’s open the trace, and be warned it’s not going to be fast! Note: you will need to pass the binary as before px.trace if you are using Go 1.8 or earlier versions. The trace has been split into many pieces to avoid overloading the browser. Let’s open one somewhere around the center. This, again, will be quite slow. Patience is your friend. It seems like the CPUs are really busy this time! But, let’s zoom in a bit. Oh, that doesn’t seem like it’s very well utilized after all. 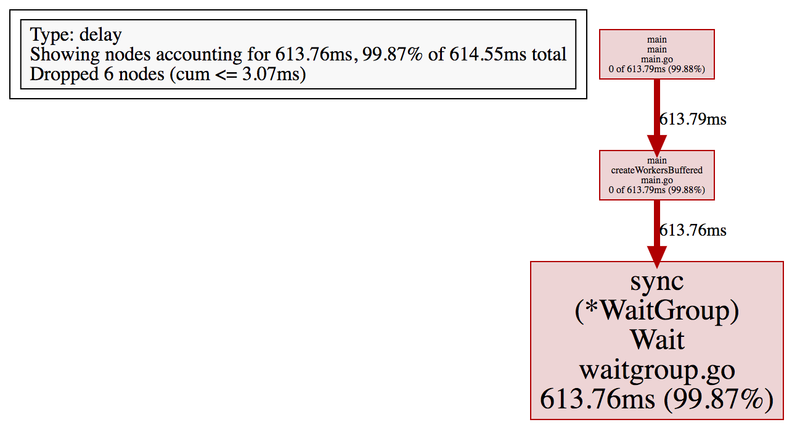 We’ve created too many goroutines, which causes too much pressure on the runtime, both the scheduler and the garbage collector, and it shows as contention and wasted CPU time. Ok, so … is this program correct? Are there any data races? The easiest way to show that there are no obvious data races is by using the data race detector. There’s a limit of 8192 alive goroutines, and with 4 millions we clearly exceed it. Instead let’s use the benchmarks I wrote, which generate smaller images. Let’s run it with and without the data race detector to compare the performances. There’s a clear difference, but the good news it’s it didn’t panic. This means no data races were detected. There might be some data race, but the code we just run didn’t cause any. In a previous version of the code (see the video for more details) the anonymous function in the go routine didn’t get any parameters. This caused a data race on both i and j.
It’s also worth mentioning that m.Set being called from different go routines is not a problem since we are modifying different positions in a preallocated slice. Ok, so one goroutine is too few, but four millions is too many. Let’s go right in between and go with one goroutine per column. This time we’ll call createCol which creates a goroutine per column, so “only” 2048 of them. As before, let’s run it without trace first to see whether we improve the 3.2 seconds we got before. Ok, we went from almost five seconds, to three, and now less than a second! What does the trace look like? Let’s check it out. That looks pretty good! 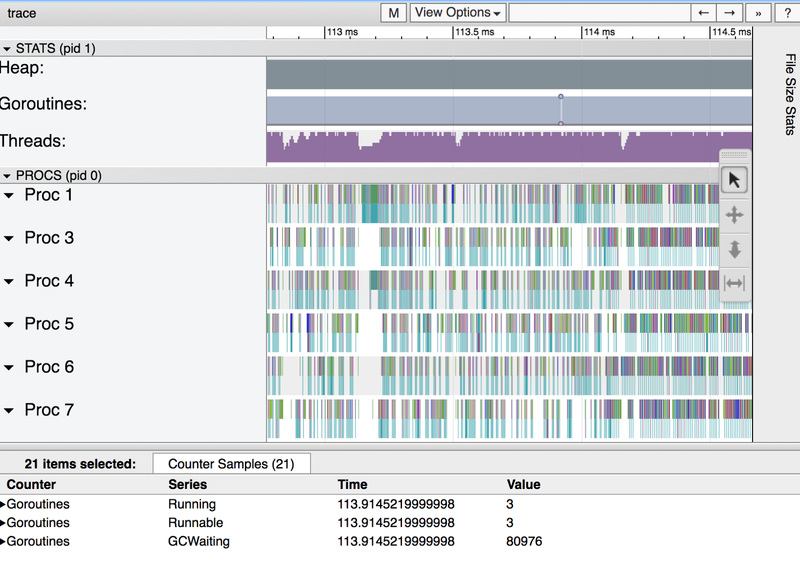 We can see that the CPUs are pretty busy first, then we move to one goroutine to encode the image into the file. Let’s zoom in, though (feeling like CSI already?). That looks very good! But, can we do better? What about the “workers” concurrency pattern? If you’ve written enough Go, you migh have encountered the “workers” pattern, where we create a small number of workers (eight in this case) which fetch tasks from a channel. We also use a sync.WaitGroup to make sure all workers are done before exiting. We have a smaller number of goroutines, but definitely enough of them to distribute across all processors. This should be faster, right? Well, never trust your instincts when it comes to performance analysis. Let’s run it and see, first without the tracer. Ok, so this is not better than creating a pixel per goroutine! Why? Well, time to trace. 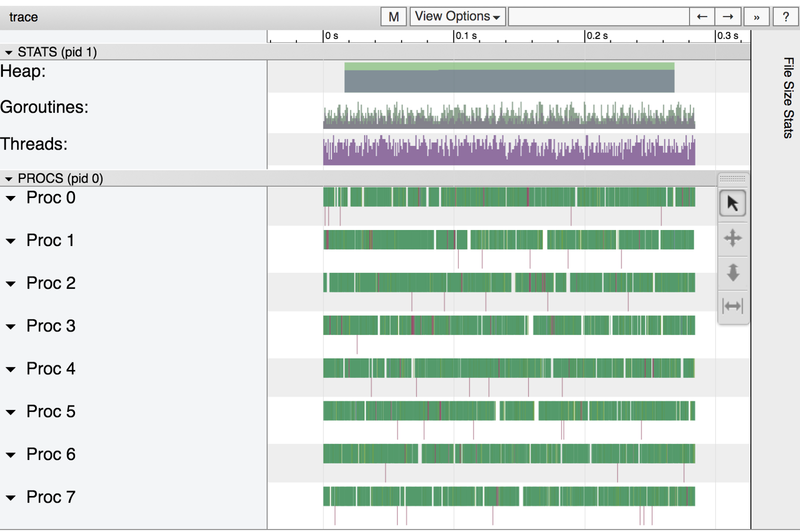 This is again incredibly slow, so clearly we’re logging many events. What are those events? Again it seems quite good from far away, but when you zoom in it looks quite different. Where is the contention coming from now? The runtime should be totally fine with eight goroutines, 2048 was not too many. 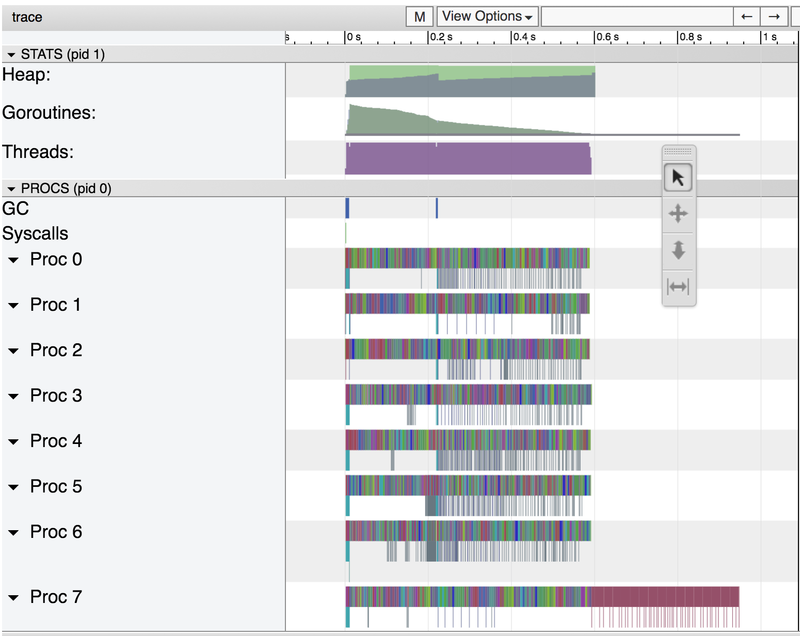 Well, let’s go back to the menu where we clicked “View Trace” but instead let’s click Synchronization blocking profile. You’ll see a graph generated by our old friend pprof. In this graph we can see the contention due to synchronization primitives such as channels and mutexes. So our goroutines spent almost 48 seconds blocked receiving from a channel! That’s, obviously, a problem. Why is this? Our channel is being used as a way to communicate between the main goroutine sending pixels, and the workers. This happens 4 million times, which causes a lot of contention. How could be avoid most of this contention? Buffered channels in this case will make most of the send and receive operations non blocking! You don’t trust me? You don’t need to. Let’s modify the program to use a channel with a buffer of a size that allows us to fit all of the pixels. The rest of the function is exactly as the previous one. Will this make our program faster? Let’s see! It is much faster than before but still not nearly as fast as creating one goroutine per column. The tracer shows that we still have some contention, and pprof quantifies it to 613ms. Sending values through channels has a very low cost, but it does have a cost and we’re doing this over 4 million times in this program. It seems like a good idea to limit this cost by creating fewer tasks. How can we even do that? Each task should be larger: let’s create a task per column. Pretty fast! And if we added a buffer to the channel, as shown in createColWorkersBuffered? Just a tiny bit better. So, it seems like creating one goroutine per column is the fastest option, but probably this changes given different image sizes. It is time to write benchmarks (they’re already written in the repo! ), look at the traces and pprof data and make sensible and informed decisions. We saw how pprof allows us to see how our program uses the CPU and how much locking contention exists. Pprof also provides a way to profile memory allocations which we didn’t cover. On the other side we saw the tracer, that allows us to have a very detailed view of what our program does, specially when our program doesn’t do much! I hope you enjoyed this post, let me know what you think at @francesc and subscribe to #justforfunc for more content every two weeks!